Villa Niloufar is a secluded, riverside retreat, characterised by an abundance of space and natural beauty, just minutes from one of the best golf courses in Asia. An eco-friendly, 5-bedroom, destination villa with sophisticated facilities, caring staff and superb service, ensuring guests will have no real need to go out. 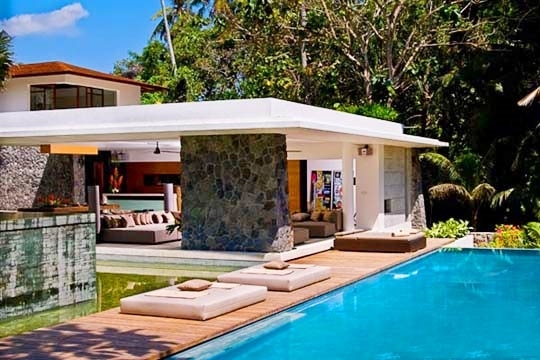 A superb piece of funky post-modern architecture, the five-bedroom Villa Niloufar is a designer-statement of tropical living, resourcefully integrated into the side of a meandering river valley. 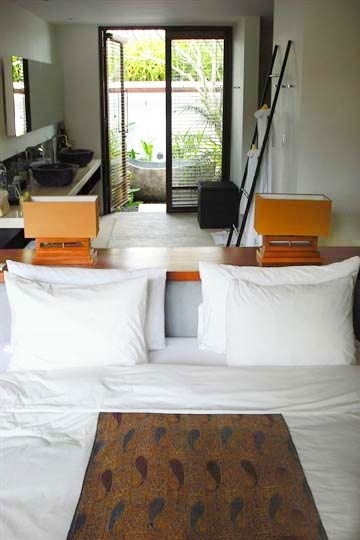 The urban chic architecture breaks away from the soaring roofs of Balinese tradition, presenting itself instead as a contemporary art form, featuring geometric precision and minimalist design with flat roofs and right-angled walls. Interiors are equally unfussy and simple, with built-in beds and segmented sofas. That’s not to say Villa Niloufar lacks charm; it is undoubtedly romantic. 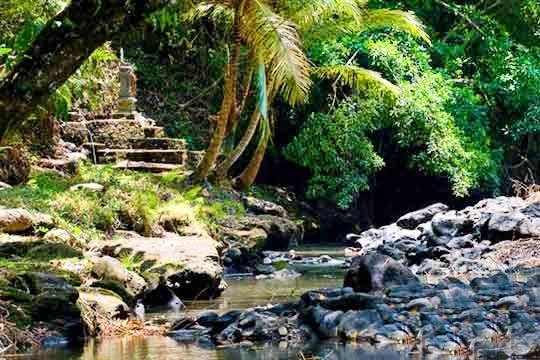 Perhaps this is because of the extraordinarily beautiful jungle and river environs in south-west Bali’s Tabanan regency. 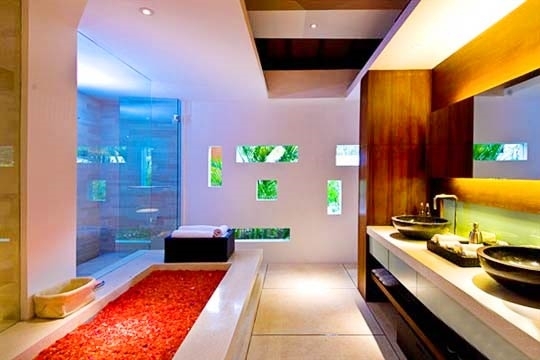 Or maybe it’s the open-air living spaces, or the bathtub waiting to be enjoyed under the stars. Or could it be due to the pink lotus blossoms that grace the two rooftop water gardens – an ingenious eco-friendly concept that serves the double purpose of being pleasing to the eye while also providing a natural cooling system. The villa’s water theme is not restricted to the rooftops: a pebble-lined pond shimmers beside the living area, while another striking elevated pond stretches past the immaculate palm-dotted lawns towards the 17m infinity-edge swimming pool and its broad ironwood deck. 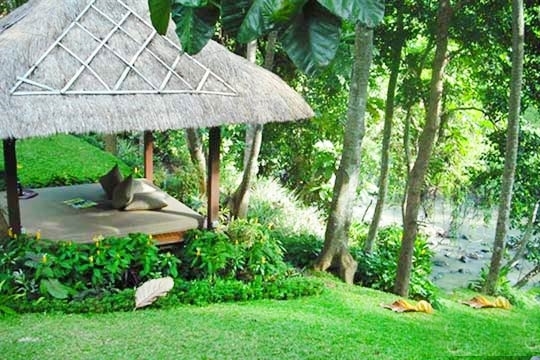 Strategically positioned on the riverbank, under the breadfruit trees, is a secret nod to tradition: a breezy thatched gazebo, for relaxing, contemplating and meditating. Here guests will be lulled by the gurgle of the river and blown away by privileged sightings of huge black butterflies, iridescent kingfishers, and the nimble monitor lizards that swim against the current. Alternatively, for those who wish to pump a bit of iron, there is a state-of-the-art gym and, for evening entertainment, a high-tech home theatre. Villa Niloufar embraces its gorgeous surroundings by showcasing natural stone walls and a fresh white décor. Designed to be self-sufficient because of its remoteness, this is a perfect party villa for groups of friends, a chill-out space for families, or a retreat for yogaphiles, supported by a great team of discreet, caring staff – including a full-time chef who will prepare meals selected from a suggestion menu – and high levels of service. 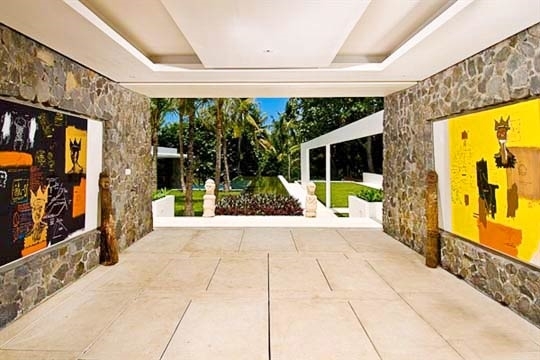 A designer-statement of tropical living alongside a meandering river valley. Upon arrival at Villa Niloufar, our opinion about the modern architecture was initially divided. But over the course of 24 hours it became two very positive ‘yays’. 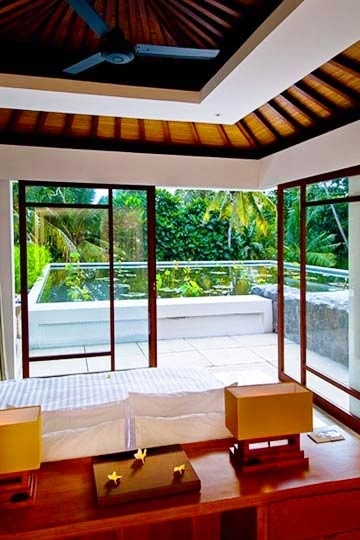 This villa is refreshingly different in that it has thrown out any pretence to traditional Bali style (thatched-roofs-and-coconut-wood) by following a rule of its own. Despite its clean lines, nature is embraced by the design. Niloufar is also way more eco-friendly than most villas profess to be, with passive cooling techniques such as cross ventilation and rooftop ponds, an advanced ioniser filter system for the swimming pool, and a water recycling system that allows waste water to be reused in the gardens. We first reviewed Niloufar in 2009, and on a recent revisit we were impressed with how well the villa has been maintained. The staff are friendly and diligent; they are there when you need something, but also understand the importance of privacy. 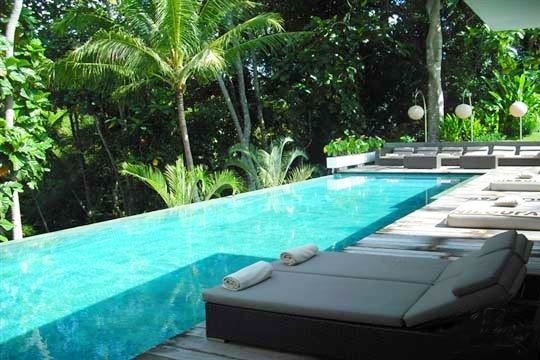 The infinity lap pool sits above the river valley with beautiful views, while the sun loungers at the far end are in the form of one large daybed with individual uprights, making for a very communal lazing space. Once installed in the gazebo with the drink of your choice, you can sit back and enjoy the scene in front of you: the river, banked with mature trees, giant bamboo and jungle, and a rice terrace on the far side. This is also a great place for a massage. 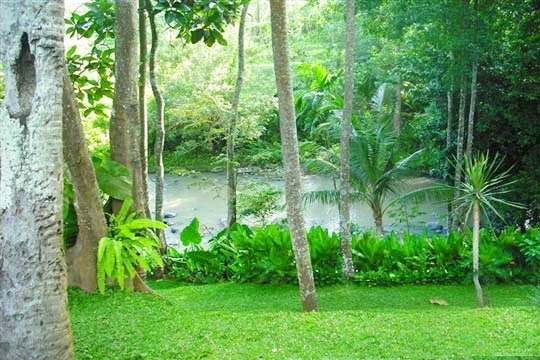 Judging from the sights and sounds, there is an abundance of wildlife around the villa; we counted many swifts and kingfishers, and even watched a large monitor lizard lazily swim across the river. A dip in the river is fun, there are a couple of small rapids and the water is super-refreshing (but don’t swallow it). There is also a small temple and a holy freshwater spring on the river’s edge. It’s a thrill to stay in a piece of modern architecture that feels as though its roots are in the dwellings of the ancients. Niloufar just lends itself to total relaxation of both the lying-beside-the-pool-doing-nothing and the party-all-night varieties. 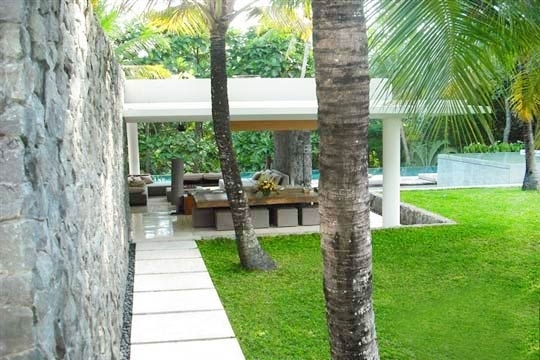 The close-to-nature location, the peace and serenity, and the house design are a true joy to experience. With few restaurants in the vicinity, it is essential that the chef is good, and we were duly impressed. Although we loved it, the minimalist architecture may not be everyone’s cup of tea. We felt that the villa could possibly benefit from having a ‘softer’, less severe collection of paintings, but then again everyone has different tastes! Villa Niloufar is located on the outskirts of the sleepy village of Buwit, between Seseh and Tanah Lot in the Tabanan regency. There is very little in this beautiful rural area apart from rice fields and the jungle-clad river valley. Enchanting Buwit is a stunning example of a traditional Balinese village. The nearby Nirwana Bali Golf Course (4km) was designed by Greg Norman and voted the number one golf course in Asia. 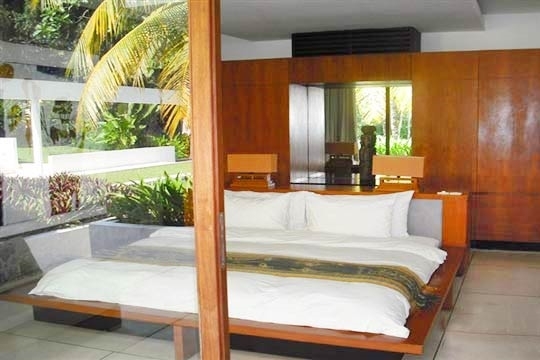 It is situated beside the famous Tanah Lot sea temple, which is perched on a craggy wave-lashed rock. The coastline is rugged and the beaches not safe for swimming. Villa Niloufar is comprised of a main single-storey living pavilion and five bedrooms in three separate pavilions, all but one of which are on ground level. Presiding over the gardens and swimming pool, the main pavilion is the social hub of the villa. Open on three sides and cooled by fans and natural breezes, it houses the living and dining areas, a terrazzo bar, a gourmet kitchen, and a media room, fully equipped with a home theatre, including a 42-inch TV, DVD player and four, 300-watt speakers. An antique Timorese dining table and primitive statues complete the fusion of the ancient and the avant-garde. The interior design is stylish and restful, with modern fittings and fixtures, harmonised with custom-made teak furnishings. The five air conditioned bedrooms all have king beds, wardrobes and ensuite bathrooms. There are two master bedrooms, one of which is situated at the top of an external stone staircase, parallel to the lotus pond that rests upon the roof of the main building (where a built-in daybed is perfect for relaxing and gazing at the view). 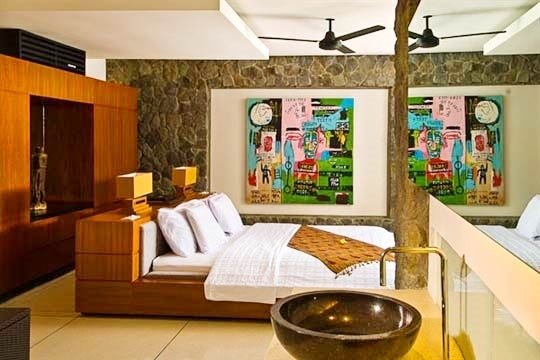 This bedroom is adjoined by an outdoor bathing area planted with palms, ablaze with bougainvillea and dominated by a deep oversized bathtub sculpted out of solid black river rock. 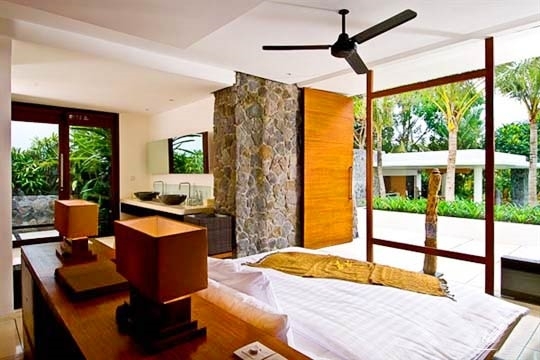 The second master bedroom enjoys lovely views of the garden and terraced rice field. Doors set back on either side of the bed open into the bathroom, complete with a large terrazzo tub, twin washbasins and rain shower. 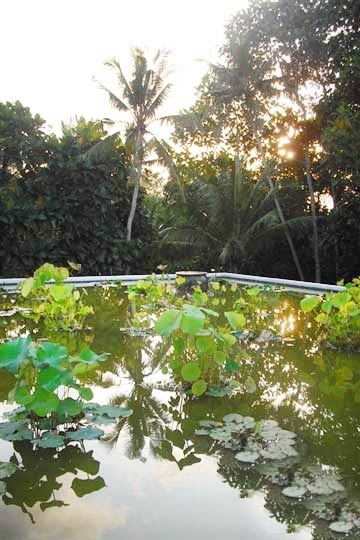 The remaining three bedrooms are tucked under another lotus pond roof. 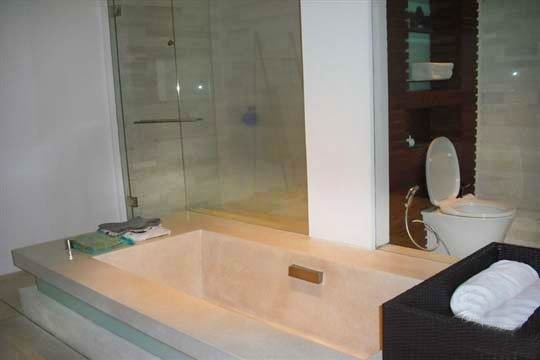 Two have indoor bathrooms with rain showers, and one has a walled garden bathroom with an outdoor rain shower. The beautiful 17m pool is perfect for swimming laps. It is bordered by a wide timber deck, furnished with daybeds, and softly lit at night by hanging lanterns. 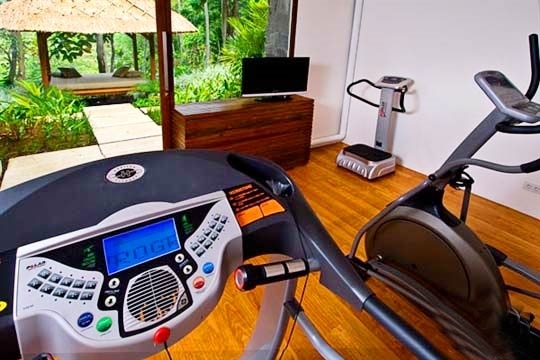 An air-conditioned gym fully equipped with with elliptic, power plates, treadmill and steps, as well as audio-visual facilities, is located underneath the pool overlooking the river. A convenient outdoor shower has been installed on the steps between the gym and the pool deck. 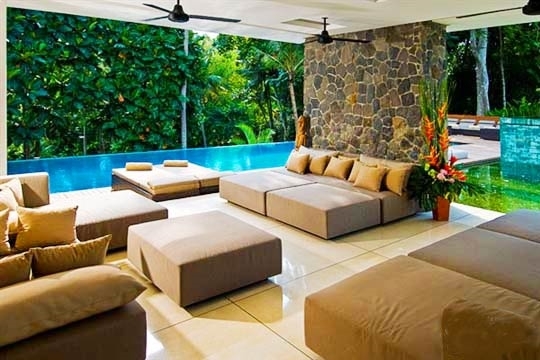 Upon arrival at the villa you are required to pay a security deposit. The security deposit will be returned to you prior to departure less any extra charges or costs for accidental damage to the property. 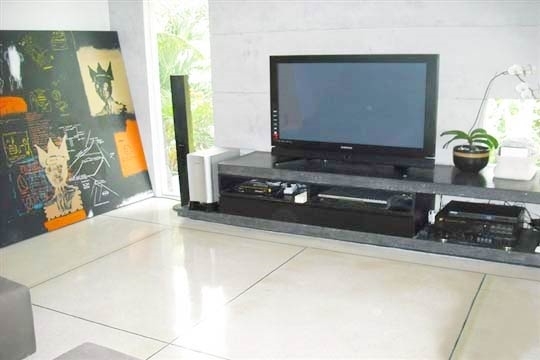 The security deposit required is up to USD2,000. 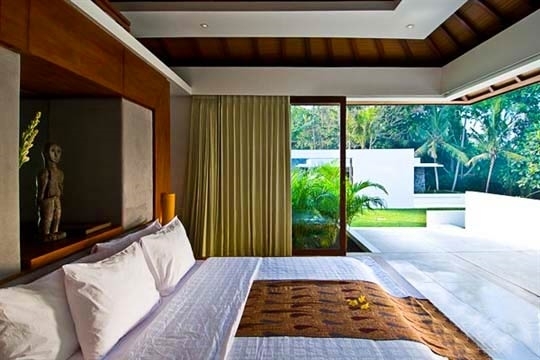 5 bedroom villa located in Seseh-Tanah Lot, Bali. Ideal for Beach in ten, Body and soul, Eco aware, Going for golf, Fair share for groups, Party pads, Room with a view.